Tetra Tech understands the value of resiliency planning and sustainable design in addressing emerging risks associated with a changing world. We develop unique solutions to some of the toughest problems—using both cutting-edge technologies and commonsense approaches. As conceptual frameworks, resilience and sustainability increasingly guide decisions in the planning, design, and engineering of our projects. Resiliency emphasizes robustness and the ability to recover, while sustainability considers measures of environmental impact and resource conservation. Both concepts share common end goals in contributing to society’s capacity to thrive in a meaningful way. In this Sustainable Design article series, we highlight Tetra Tech projects that represent some of the industry’s very best examples of resiliency planning and sustainable design. Where resilience asks how to build infrastructure that can withstand a changing environment, sustainability considers how facilities can be designed to integrate with their surroundings—minimizing environmental impacts, waste generation, and energy consumption. Tetra Tech’s growing global sustainable infrastructure practice is using innovative design approaches to control temperature, reduce energy costs, and conserve water. The eco-district concept, originated by the City of Portland, Oregon, and the Portland Sustainability Institute, is an emerging model of building design and community development that emphasizes sustainable, neighborhood-level urban regeneration focusing on collaborative social, economic, and ecological designs. The concept is rooted in social equity, economic opportunity, inclusion, and the benefits of shared infrastructure—by using single water, energy, and waste systems across multiple buildings, greater efficiencies can be realized and environmental impacts reduced. 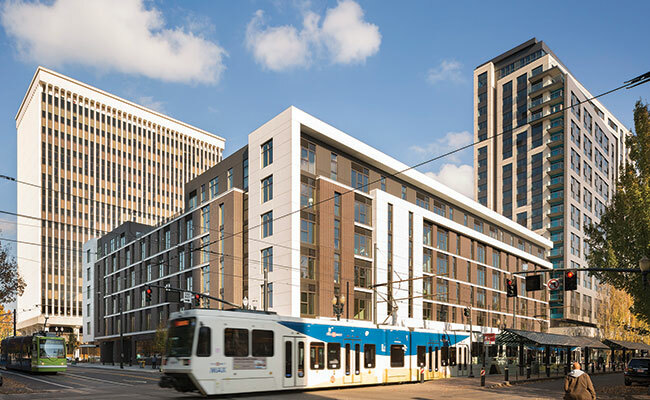 Tetra Tech was able to reap significant savings in energy, water, and waste streams using a holistic approach for the mixed-use Hassalo on Eighth project built according to the eco-district framework. The Hassalo on Eighth development includes 657 apartment units and ground-level retail space dispersed over three buildings, an outdoor urban plaza, and the largest bicycle hub in North America. Among the numerous sustainable features integrated into the project design are stormwater swales, green roofs, and rainwater catchment. Tetra Tech provided MEP, lighting, and low-voltage design as well as energy analysis and fundamental commissioning, joining a team of firms on the project including GBD Architects and developer American Assets Trust. One of the innovative shared features of Hassalo on Eighth is the Natural Organic Recycling Machine (NORM), a decentralized wastewater treatment and reuse system that treats all greywater and blackwater from the development for reuse in toilet flushing, cooling tower usage, and irrigation, with any available excess used for groundwater recharge. Tetra Tech, in collaboration with Biohabitats, GBD Architects, and PLACE Studio, worked to integrate the system, which takes wastewater through an 11-step process that includes an anoxic reactor, trickling filters, and a series of constructed wetlands. NORM helps ease the burden on Portland’s aging, strained combined stormwater and sewage system, demonstrating that development-scale innovation can play a role in improving water quality in the Willamette River. The system diverts 45,000 gallons of wastewater per day from entering the city’s combined sewer system and saves up to 20,350 gallons of potable water daily. “Combining the water and sewer savings with the city development fee reductions, the water system design is expected to pay for itself in about three years,” said Mario LaMorticella, a Portland-based project engineer with Tetra Tech. Hassalo on Eighth achieved LEED v4 Triple Platinum certification, and the U.S. Green Building Council named it as the 2017 LEED Homes Award Project of the Year. A city is the sum of its parts—buildings, communities, coastlines—and efforts to enhance long-term resilience and sustainability must reach across all of them. Tetra Tech’s community resiliency specialists and global sustainable infrastructure teams are demonstrating what can be achieved through collaboration, creativity, and an unwavering dedication to the highest principles in planning, design, and engineering. By leading in projects that advance resiliency and sustainability, we can continue to deliver the most effective solutions to our clients and help ensure a vibrant and enduring future.